The Forward Fund provides grants that will help attract the brightest young minds in cancer and/or immunology research to the cancer immunotherapy domain. It informs those outside of the cancer immunotherapy field about the huge promise of this modality, which offers the potential of creating long-term remissions and/or prolongation of survival for people suffering from an expanding array of advanced cancer types.The Forward Fund also educates established clinical oncologists regarding the application and potential benefits of this treatment modality. The Forward Fund is proud to financially support the Richard V. Smalley, MD Memorial Award and Lectureship, the Presidential Award and the Young Investigator Travel Awards. Information about these awards can be found below and the pages therein. In memory of past SITC president and charter member Dr. Richard V. Smalley, SITC is proud to present the annual Richard V. Smalley, MD, Memorial Award and Lectureship each year to a recognizable clinician/scientist and luminary in the field that has significantly contributed to the advancement of cancer immunotherapy research. Established in 2005, it is the society’s most prestigious award serves to honor those that have been pioneers in their work and made a notable impact worthy of high regard and recognition by their peers. As a part of the award, the honoree serves as a primary keynote presenter at the Annual Meeting, giving a 45-minute lecture on his/her research and the award is accompanied by an honorarium of $5,000. Established in 1991, the SITC Presidential Award serves as recognition to the young investigator deemed to have the most outstanding oral abstract presentation at the SITC Annual Meeting. The winner of the Presidential Award will receive: $1,000 honorarium, up to $1,000 in travel reimbursement, one year membership in SITC, a commemorative Presidential Award plaque, and a poster ribbon noting them as a "Presidential Award Winner". 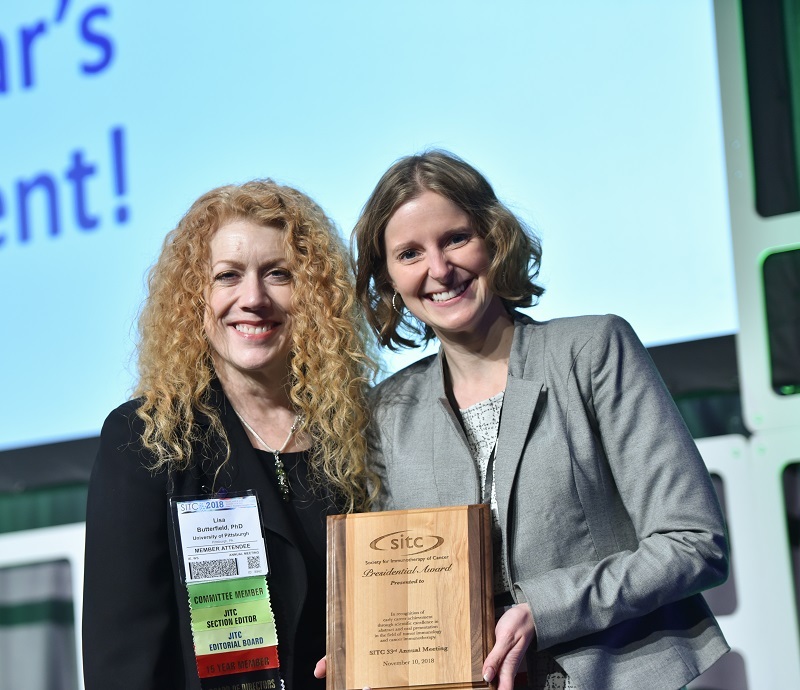 Kristin G. Anderson, PhD, of Fred Hutchinson Cancer Research Center, accepts the 2018 SITC Presidential Award from SITC President Lisa H. Butterfield, PhD. To promote growth and achievement amongst young investigators in the field of cancer biologics and to recognize excellence in SITC Annual Meeting oral abstract and poster presentations, SITC offers the "Young Investigator Awards." Each year, the Journal for ImmunoTherapy of Cancer (JITC) honors several of its top authors from the past year with an award at the SITC Annual Meeting. The JITC Best Paper Awards celebrate excellence in scientific research and are awarded to researchers demonstrating leadership in the field as well as innovation and high-quality execution and discussion in their manuscripts. Launched in November 2015, the Connect-a-Colleague campaign is designed to encourage members to personally reach out and invite potential members to join the society. An online tool was created for members to refer multiple potential members at a time. New members are also encouraged to indicate SITC members who referred them for membership. The Society for Immunotherapy of Cancer (SITC) Public Service Award honors an individual or group that has made substantial contributions to fostering and enhancing the field of cancer immunotherapy through increasing public understanding and awareness, research efforts, and/or funding for cancer immunotherapy. This year, SITC would like to recognize Mr. Sean Parker for his efforts in championing cancer immunotherapy through the development of The Parker Institute for Cancer Immunotherapy and for increasing the public’s understanding and awareness of cancer immunotherapy. The World Immunotherapy Council—a collaborative group of more than 20 organizations from the U.S. and abroad with a shared interest in promoting research and translation of cancer immunotherapy—selected the young investigators below to present during the 2nd World Immunotherapy Council Young Investigators Symposium, part of SITC’s 32nd Annual Meeting & Pre-Conference Programs in 2017.